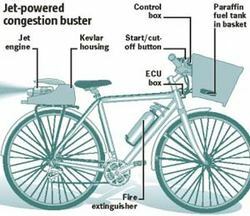 Clarkson loves it: a bicycle fitted with a jet engine that can do 70mph and may even beat the London congestion charge. Emma Smith reports Jeremy Clarkson has gone green. The Top Gear presenter has finally bowed to pressure from the environmental lobby and got himself a bicycle. It has a wicker basket on the front, a jet engine at the back and a theoretical top speed of 70mph. Built for the MPH 06 motor show, a motoring circus co-hosted by Clarkson, it has made such an impact the designers are thinking of producing it for sale. The bike uses a standard JetCat P-180 model aircraft engine that can be bought over the counter at model aircraft shops or from online modelling specialists for about £1,800. Reinventing the motorcycle? Isn't he defeating the whole environmentally friendly thing by going back to a fuel-powered jet -engine? I love how the article photo features a fire-extinguisher where most normal people would have a water bottle.